Flow cytometric analysis of Jurkat cells, untreated (blue) or treated with TPA #4174 and ionomycin #9995 (200 μM and 3 μM, 4 hr; green), using Nur77 (D63C5) XP® Rabbit mAb (PE Conjugate). 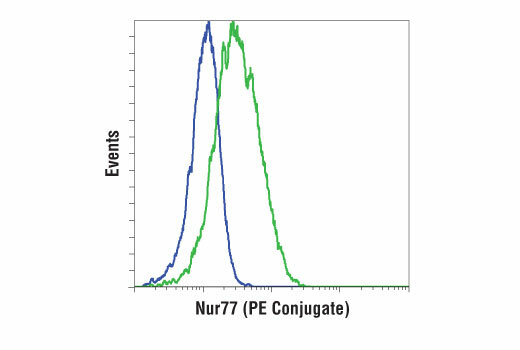 Nur77 (D63C5) XP® Rabbit mAb (PE Conjugate) detects endogenous levels of total human Nur77 protein. Monoclonal antibody is produced by immunizing animals with a synthetic peptide corresponding to residues surrounding Leu535 of human Nur77. This Cell Signaling Technology antibody is conjugated to phycoerythrin (PE) and tested in-house for direct flow cytometry analysis in human cells. This antibody is expected to exhibit the same species cross-reactivity as the unconjugated Nur77 (D63C5) XP® Rabbit mAb #3960. Nur77, also known as TR3 and NGFI-B, is an immediate-early response gene and an orphan member of the steroid/thyroid/retinoid receptor superfamily (1-3). Nur77 is composed of an amino-terminal transactivation domain, a central DNA-binding domain and a carboxy-terminal ligand-binding domain. Expression of Nur77 is rapidly induced by a variety of stimuli, including apoptotic, mitogenic and stress signals (1-6). It has been proposed to have many functions related to cell proliferation, differentiation and apoptosis. Nur77 has been extensively studied in T cells where it has been implicated in the process of negative selection and TCR-mediated apoptosis (5,6). Nur77 binds to specific DNA elements leading to the regulation of target genes (7). As a possible mechanism for regulating apoptosis, Nur77 can induce the expression of apoptotic genes such as FasL and TRAIL (8,9). Nur77 is heavily phosphorylated by multiple kinases, which may affect its transactivation activity as well as its subcellular localization (4,10,11). Translocation of Nur77 from the nucleus to the mitochondria can regulate its association with Bcl-2 and control the release of cytochrome c, thereby triggering apoptosis (12,13). Hazel, T.G. et al. (1988) Proc. Natl. Acad. Sci. USA 85, 8444-8448. Chang, C. and Kokontis, J. (1988) Biochem. Biophys. Res. Commun. 155, 971-977. Milbrandt, J. (1988) Neuron 1, 183-188. Fahrner, T.J. et al. (1990) Mol. Cell. Biol. 10, 6454-6459. Liu, Z.G. et al. (1994) Nature 367, 281-284. Woronicz, J.D. et al. (1994) Nature 367, 277-281. Wilson, T.E. et al. (1991) Science 252, 1296-1300. Weih, F. et al. (1996) Proc. Natl. Acad. Sci. USA 93, 5533-5538. Rajpal, A. et al. (2003) EMBO J. 22, 6526-6536. Hirata, Y. et al. (1993) J. Biol. Chem. 268, 24808-24812. Hazel, T.G. et al. (1991) Mol. Cell. Biol. 11, 3239-3246. Li, H. et al. (2000) Science 289, 1159-1164. Lin, B. et al. (2004) Cell 116, 527-540.